It happens all the time in traditional negative campaign ads. In print and on television, it's not uncommon for a candidate to include an unflattering or grainy picture of an opponent, or to extract a line from an opponent's speech out of context. But in this age of computerized media, the old protocols of campaign hardball are yielding new questions. For example, when this kind of campaign trail distortion happens between two campaign Internet sites, is it just another form of realpolitik, or is it hacking? The question surfaced this week in Washington State, in a race between U.S. Slade Gorton, R-Wash, and Maria Cantwell, a Democratic contender. The case illustrates that, for better or for worse, online politicking is transitioning to the mainstream. The fireworks started with what's technically called a "deep link." 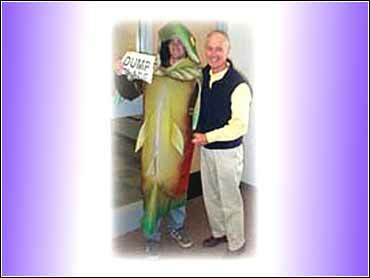 Cantwell's Internet director John Beezer tapped into a photo from Gorton's campaign site that showed senator posing with an environmentalist dressed as a giant salmon. The Cantwell campaign used it to accuse Gorton of mocking salmon protestors. But the campaign did not identify the source of the photo, though it was linked directly to Gorton's web page. "There was no attempt to make it clear where it came from, but no attempt to hide it," said Beezer, who says he acted alone. "Admittedly, it was somewhat sneaky, but it was above board." When the Gorton campaign found out about the use of the photo, it retaliated by changing the photo to which the Cantwell site was linked. So for several hours, supporters visiting Cantwell's homepage clicked on to a flattering photo of Gorton surrounded by a large, cheering crowd. "In the little exchange of pranks," said Beezer, "I'm willing to admit I lost." But who loses in the long run remains to be seen. At first, the Gorton campaign accused Cantwell of foul play. "We find it interesting that a candidate who is talking about the importance of Internet privacy and security would choose to hack the Web site of one of her opponents, pirate its content, and violate his intellectual property," said a statement on Gorton's campaign page. But on Thursday, after the accusations appeared in three major Puget Sound newspapers, a Gorton spokesperson made light of the issue. Cynthia Bergman told CBSNews.com the whole matter was meant to be tongue-in-cheek. "The bottom line is we were trying to see if they truly have a sense of humor about this," said Bergman. "We have no problem with them linking to our site. Just identify where you got (the photo.)" On that same day, the Gorton campaign updated its web page statement, removing the accusations against Cantwell and referring to the entire incident as a "fun little episode." "They realized they misspoke and over spoke," fired back Cantwell campaign manager Ron Dotzauer when told of the Gorton response. "They called t piracy and hacking and no one in the industry believes that for one second." "Hacking is the wrong term," agreed Larry Magid, a computer expert and technology consultant. "It implies they got into the site and altered the content." But Magid added, " it may be a form of misrepresentation." So-called "deep links" connect to a specific element on a page, rather than to the page itself, and thus have the potential - in politics especially - to present material out of context. That may amount to dirty politics, but it's not a breach of security. Nor is it an uncommon practice on the Internet; deep linking is as old as the Internet itself. "It's not a privacy issue," said Magid. "(Gorton) put that picture out on the web, into the public domain." And Cantwell's Democratic primary opponent, State Insurance Commissioner Deborah Senn, also weighed in publicly on the issue. A spokesperson suggested to The News Tribune in Tacoma that the episode illustrated Cantwell's hypocrisy regarding Internet privacy. But Dotzauer hopes the Cantwell camp can use the current media attention to its advantage. "Gorton has gone out of his way to demonstrate to the technology industry that he's their friend. What he's just demonstrated to them is he doesn't understand technology," he said. "At the end of the day, it's a net, net plus for us."